Would you like to put a little thrill in your party? Rakadu dancers make fabulous performers for parties and events. We offer many options for social events, educational projects, parties and gatherings. 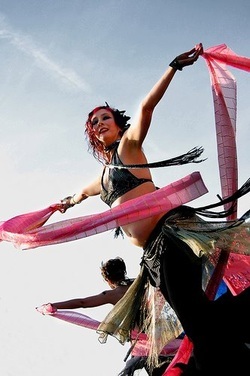 Whether you want to hire an individual dancer for a birthday belly gram, girls night out with a group belly dance lesson and performance, a full ensemble performance with several dancers and musicians, or just need a middle eastern band to play at your event, we can help. We even have hula dancers for luau parties! Instructors at Mecca are also available for private lessons.